"At the time, I didn't think she was dangerous. None of us did." "Man is the breadwinner, and woman is the homemaker. It's the way it's been for years." Andrea Pia Kenedy was born on July 2, 1964 to a Houston Texas family. She was very close to her father, a teacher. She graduated Milby High School as valedictorian in 1982. The quiet, shy, intelligent, University of Texas Health Science Center graduate became a Registered Nurse. She and Russell Yates both, 25 years old, were living in the same apartment complex when they met. Russell purchased a large new home for his bride to be in Friendswood, Texas on March 30, 1993. A couple weeks later, after dating for three years, the young couple who shared the same ideals on religion and family married in an informal wedding ceremony, performed by a nondenominational Clear Lake Park pastor. Andrea and Russell promised their guests that they planned on as having as many children as God allowed and would not consider birth control. They spent their honeymoon in Cancun Mexico. The following June, Andrea became pregnant with Noah who was born on February 26, 1994. She gave up her job at the University of Texas, Anderson Cancer Center to become a full time mother to Noah. Shortly after his birth she had hallucinations about a knife stabbing, but said nothing. She had auditory delusions of Satan speaking. She kept these events to herself. When she became pregnant with her second son, John, born December 15, 1995, Andrea completely gave up swimming, jogging, and socializing with friends. Andrea feeling desperate reached out for help early in 1996.She described an empty life of loneliness in a letter she wrote to Rachel, the wife of Michael Woronieck, a self-proclaimed prophet and self-ordained, traveling evangelist, that Russell knew from college. -- the Hell fire and brimstone type--with a history of his own legal troubles. The preachers wife, Rachel, instructed her to read a section of the Bible that describes the role of women is to love their husbands and children; work at home; and subject themselves to their husbands desires. Woroniecki and his family lived as vagabonds out of a bus for years. Woroniecki yelled out his sermons in the street street. He browbeat his followers for their sins and convinced them they were in danger of losing God's love. Both Russell and Andrea were very impressed with this ministry. Letters from the Woroniecki's berated Andrea for her unrighteous standing before God. Twice Andrea was hospitalized for two separate suicide attempts, two months after receiving cruel, harsh letters from the Woroniecki's. Woroniecki hated Catholicism which was Andrea's faith. He warned her about the sins she carried as a former Catholic. Woroniecki himself was raised Catholic and his mother was very active in the Charismatic movement of the Catholic church in the early 1970's. When Russell was offered a six-month NASA project in Clearwater, Florida, he moved his family into a 38' travel trailer wanted to live on the road and leased out their home. They set up camp in Hitchcock, Texas on October 12, 1996 at Lazy Days RV Campground for a month prior to moving on to Florida. By November 1996 they were settled in a Seminole, Florida RV camp. In December 1996, less than a month after Andrea had a miscarriage she was pregnant with Paul. June 1997, they returned to Lazy Days RV Campground in Hitchcock Texas and Paul was born September 13, 1997. In the newsletter they published, the Woronieckis advertised their converted bus, a 1978 GMC 300-square foot motor home, used for their traveling salvation shows, for sale in Miami. Russell bought it in May 1998. Luke was conceived during the trip . When they returned to the Lazy Days RV Campground, residents noticed that Russell was unfriendly towards neighbors. On July 23, 1998, Rachel wrote to the Yates, praising Andrea for "taking to heart the things they shared" and thanking Russell for his donation. That October they sold their house to live in the bus permanently. Noah and John slept in the cargo area, while Andrea, Russell, Paul, and Luke slept in the cabin. The Yates continued to a long distance relationships with the Woronieckis, as they withdraw from others. Luke was born on Feb. 15, 1999. From March through May 1999 Andrea cared for her father with Alzheimer's disease and the effects of a heart attack. Andrea will visit people at their home but does not want anyone dropping by the converted bus where they live in. Friends and family noticed that Andrea seemed exhausted, yet they drove the the bus to the Grand Canyon and Lake Mead. On June 16, 1999, Andrea called Russell at work, asking him to come home. He found her in the bus shaking, crying, and biting her fingers. He took her to her parents' house. The next day, Andrea overdosed on her father's prescription medication in a suicide attempt to commit. She took pills to "sleep forever," but felt guilty because she had a "family to live for." She was rushed to Houston's Ben Taub General Hospital where she was diagnosed with a major depressive disorder and then admitted to Methodist Hospital's Psychiatric Unit on June 18, 1999. Andrea refused medication. Andrea wanted to stay off medication so she could breast feed. Andrea's social worker Norma Tauriac, called Russell because Andrea wasn't giving her information. On June 19, 1999, Andrea's psychiatrist James Flack, diagnosed her as severely depressed and essentially non-verbal. She quit breastfeeding and started taking Zoloft. She had a history of psychiatric hospitalizations, and two suicide attempts. She was diagnosed with postpartum depression with psychotic features and schizophrenia but was not taking antipsychotic medications.The full time wife and mother of five children under the age of seven-the youngest three were under three-years-old had recently miscarried her sixth child. She home schooled her older children. Andrea's serious mental condition and hospitalizations placed a burden on him as he was trying to run the household and do his job. He attempted to work from home but with so many young children it was difficult to get much work accomplished. On June 20, 2001, when Rusty left for work, Andrea, catatonic due to her mental illness, was eating cereal out of the box. He didn't like leaving her with the children alone but he had an important meeting at work and expected his mother to be there soon. Once he was gone, Andrea, drowned all her five children in a bathtub. She called the police and she called husband at work to report what she had just done. "I just killed my kids." When the police arrived, she took an officer to a bedroom where four tiny lifeless bodies laid on the bed -- one was still floating in the tub. She told the officer she drowned her children, Noah, 7, John, 5, Paul, 3, Luke, 2, Mary, 6 months old, in the bath tub. She had to chase down one son to his death. As the child fought for life he tried to tell his mother 'I'm sorry." "Why?" the police asked her. She believed her children would suffer in hell because mark of the devil was hidden under her hair. She was evil; possessed by Satan. She had to kill her children before it was too late for them to get to heaven. She was immediately taken into custody. She had a jailhouse visit from her husband, that same day. During a hearing to determine competency to stand trial, a psychologist testified of her satanic delusions; how her execution would destroy Satan. When George Parnham, 65, an advocate for both women's mental health issues met Andrea, the day after she drowned her children, she said softly: "Please, don't leave me alone." Parnham represented Calvin Bell, acquitted by reason of insanity in a 1992 Elementary School shooting spree after he stopped taking antipsychotic medication. He fired 14 shots; injuring two Houston police officers. "I got a sense of the reality of people who live in an unreal world. Then, when Andrea came around, it was so patently obvious she was mentally ill. That drove me to want to understand more about the subject so I can better help people like Andrea and Calvin and anybody else who surfaces in my practice." Texas Jury--Insanity Defense -- The Texas law regarding the insanity defense is based on a standard established in 1843. The Drowning trial began with details of Andrea's postpartum depression following the miscarriage of her 6th child. The Harris County psychiatrist treating Andrea since her arrest testified that she was one of the sickest patients she had ever seen. State District Judge Belinda Hill considered appointing a special prosecutor to investigate whether Russell and Harris County District Attorney Chuck Rosenthal violated a gag order. Yates and Rosenthal were interviewed on CBS-TV's 60 Minutes in early December 2001 despite Hill's order that no witness who had been interviewed by police or prosecutors could publicly discuss the case. Andreas' family filed a complaint in April 2002 with the district attorney's office against Dr. Mohammed Saeed, her treating psychiatrist when she drowned her five children. The complaint alleges that the former medical director at Devereux Texas Treatment Network in League City, did not manage her medication properly and released her from the hospital when she was dangerously delusional. Andrea was never officially tried in the deaths of Paul and Luke. The state separated the cases as part of their plan that if for a reason she was not convicted in one trial they would still have another capital case against her. She was found guilty for the deaths of three children and sentenced to 40 years in prison, making her eligible for parole after 2041. Yates represents a new kind of misuse of the death penalty -- people behind bars instead of in mental institutions; because prosecutors used the death penalty to advance their own careers instead of justice. January 6, 2005, the Texas First Court of Appeals in Houston overturned that conviction and ordered a new trial due to false testimony from the prosecution's expert witness, Park Dietz, forensic psychiatrist and consultant for crime entertainment shows. As a forensic psychiatrist; he testified that an episode of "Law & Order" aired featuring a character with postpartum depression who was found insane before Andrea drown her children. There was no such "Law & Order" episode. Prosecutors to retry the case. November 2005 the Texas Court of Criminal Appeals affirmed the lower court's decision to overturn the capital convictions. Prosecutors were confident a retrial would result in another conviction. Harris County District Attorney Chuck Rosenthal worked aggressively to keep Andrea in prison versus a secure state mental hospital designed to treat her illness.The prosecution again used Dietz as a witness in the second trial. Jurors deliberated for over three days. 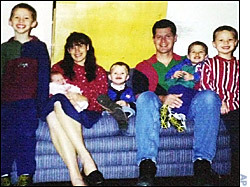 July 27, 2006, the jury found Andrea Yates, 42, not guilty by reason of insanity for the deaths of Noah, John, and Mary. Prosecutors would have to prove she was sane if she were to stand trial for the remaining deaths. A hearing determined the requirements for involuntary commitment or a mental health plan. If she does not require maximum-security confinement, she could be moved to Rusk State Hospital without a judge's approval. His five children are dead. His wife, was convicted of their murder and sentenced to life in prison. How will he go on from here? Russell divorced Andrea four years after the drownings and took a new bride the day before Andrea's hearing was scheduled. At the hearing he cried holding his sobbing aunt's hand. He commented: "The jury looked past what happened and looked at why it happened. Prosecutors had the truth of the first day and stopped there. This is about Andrea's quality of life for the balance of her life." George Parnham, said "She's going to be in a mental health facility for a very long period of time. ... I think Andrea will always be in need of some type of mental health care." Andrea is locked up with 350 other patients (270 are adult patients, 38 are women), in North Texas State Hospital, prison's Skyview Psychiatric Unit, an isolated maximum-security treatment hospital in Vernon, Texas . She is not segregated and shares a room with from 1-6 other residents. She has treatment, medication, individual and group counseling, and is encouraged to socialize with others. Eventually she may have access to fitness programs at the gym, outdoor activities, sports, and patient cookouts. Defense attorney, Wendell Odom, referred to the five years this took as a shame. "This lady never did anything wrong in her whole life," he said. "She's mentally ill. She wakes up one morning, she drowns her five kids. Come on. We all know she's insane, and it's a shame it took us this long to finally get the right verdict. The jury was able to see past what happened and look at why it happened and understand that Andrea was ordinarily just a loving mother who fell to this disease and did an unthinkable act," he said. The questions raised by what she did -- her sanity, postpartum depression or psychosis - are essential questions about human behavior -- can't be ignored or avoided. How did a woman like Andrea snap? Execution Vs. Insanity -- How can justice be served in this shocking case? Is killing is inherently "insane." A Nation In Denial About Mental Illness. An interview with the father and husband, Russell. Yates Kids Home Page -- Photos and documents. Web site maintained by husband and father, Russell Yates.